An heirloom variety from France, that holds up well over the winter. The blue solaize leeks are blue in color at full maturity. Then will turn shades of purple in cold temperatures. Great in salads, soups and as any substitution for the generic leek variety. Beautiful French heirloom, truly blue-colored leaves that turn violet after a cold spell. Very large, 15-20" stalks, sweet medium-long shaft, extremely hardy. Good for short-season areas and winter harvest. 100-120 days from transplant. Choosing: Look for bright colors and no bruising. Buying: You can purchase at your local grocery store when in season. Used in soups, stews, and salads. Cleaning: You can rinse with running water to clean. Store in cold temperature in the refrigerator. 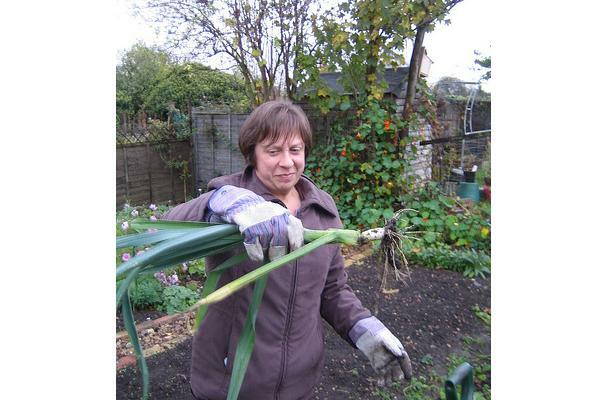 History: Leeks are common throughout Europe for as far back as we have records of food plants. The Romans called it porrum, a term retained in its present "scientific" name (our modern word "leek" comes from the Anglo-Saxon leac), and believed that the very best leeks came from Egypt, where they had been known in earliest Biblical times: indeed, the Bible states how, during the wanderings of the Israelites in the wilderness, they longed for the onions, leeks, and garlic they had had in Egypt. Nero is reported to have been nicknamed Porrophagus (literally, "leek-eater") because of his inordinate appetite for leeks, which he apparently thought would improve his voice; Hippocrates prescribed leeks for curing nosebleeds. The Romans were responsible for the spread of leeks throughout Europe and into the British Isles--Chaucer's storied pilgrims dined on leek soup. By 1775, leeks were being grown in America, by the natives as well as the colonists.